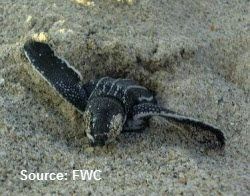 Help hatchlings home by leaving them alone. That’s what beachgoers should remember if they encounter sea turtle hatchlings emerging from nests and clambering toward the water. From now through the end of October, sea turtle hatchlings are breaking out of their eggs, digging out of nests and making their way across beaches to begin their lives in the Atlantic Ocean or Gulf of Mexico. They usually emerge from their nests at night.